WE GIVE 100% CASH BACK! 120-DAYS FOR RETURNS AND EXCHANGES! WE'RE CONFIDENT THAT OUR PRICES ARE THE BEST YOU CAN FIND IN NORTH AMERICA. BUT IF YOU DO FIND A BETTER PRICE, LET US KNOW AND WE'LL REFUND YOU THE DIFFERENCE. WHAT HAVE YOU GOT TO LOSE? If you find a better list price for the same product on another website, we will match it! When placing your order online, include the URL of your product from the competitor's website and it will be reviewed. If you are placing your order by phone, mention it to the customer service agent. FULL REFUND + FURTHER DISCOUNT OF 10%! Improve your passing accuracy with the HockeyShot Extreme Passer™. You’ll quicken your wrists, soften your hands and even work on developing a blistering one-timer! Clamps on to any shooting pad, dryland tile or synthetic ice surface. Don’t wait for a partner to work on your passing game. You can easily set up the HockeyShot Extreme Passer™ on any shooting pad, dryland tile or synthetic ice surface and do it yourself. It’s the ultimate pass training aid on the market! Easy to install on any shooting pad, dryland tiles or synthetic ice surface. Durable bungee cord returns hard passes with the same velocity. New front slope handles wobbling pucks better. 63.5 cm passing slot and weighs 2.27 kilograms. Features a carrying handle for easy transport. Excellent for working on one-timers. Develop fast hockey hands for giving & receiving passes. "After each season, I'm always looking to take my off season training to the next level! HockeyShot has everything I need to help me prepare for a breakout year! The slide board, shooting pads, passing rebounders & stickhandling trainers are the best I've used in 10 years of dry land training! 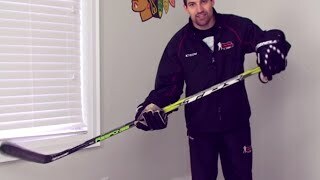 From NHLers like myself to young kids trying to improve their game I would suggest any product from HockeyShot!" "I love the redesigned Extreme Passer Clamp-On from HockeyShot because it allows players to work on three skills with one device (stickhandling, passing, and shooting). The new rebounder sends pucks back fast and flat, and it never slips off the shooting pad. This would be the first product I’d recommend to anyone looking to start building their own training center at home." Works just like we expected it to. Both my 7 and 10 yr olds pass and shoot off the passer. All good, no complaints. You need to make sure that the puck slides flat before hitting the bungee cord otherwise the puck wont bounce back. Its used all the time. Works great. Great product that our son enjoys using! Nice product, does what its made to. Works well and will be helpful with the younger boys and girls. Happy with how it works . Clamps on tight. Kids love it and sure it will help them to improve. Great product! Allows to reproduce the "bounce-back" with pucks, just like I could do with a ball and a wall when I was young. Fun and useful to reproduce certain game situation. Good size and my boys use it a lot. Works really well.